A lot of people don't like oysters on the half shell, but I do, not with lemon though, but with Tabasco and crackers. On this page are more ways to fix oysters, including Fried Oysters in Batter. If you love oysters, you love the recipe for Easy Deviled Oysters. Try some for your next party, or use as an appetizer. 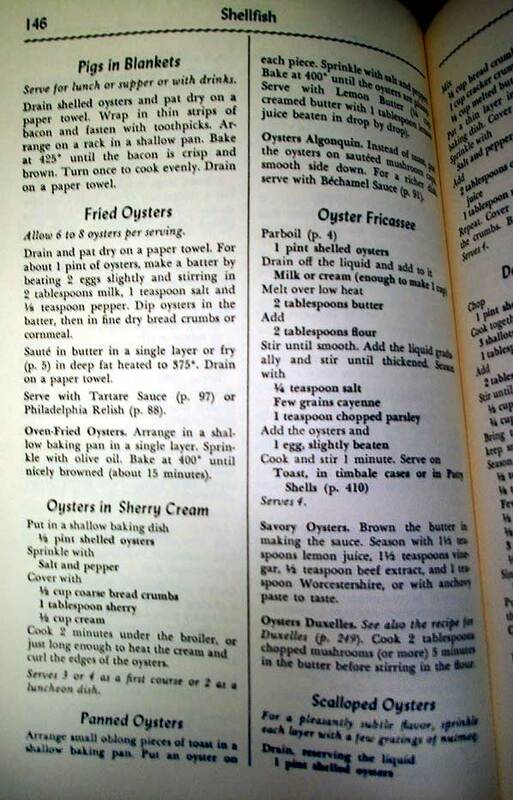 Also see this page in the Fannie Farmer Cookbook for more ways to serve and cook oysters. Such as Oven Fried Oysters, Oyster Fricassee, Oysters Algonquin, Panned Oysters, and Oysters in Sherry Cream. Pick over oysters, and remove shell fragments. Dry between towels. Mix oyster liquid, milk, eggs, salt, and pepper. Mix and sift flour and baking powder, and add to first mixture. Beat thoroughly. Dip oysters in batter. Fry in deep hot fat (375 F) 4 to 6 minutes. Drain on unglazed paper. Serves 4. Dry 24 oysters between towels. Heat broiler and grease well. 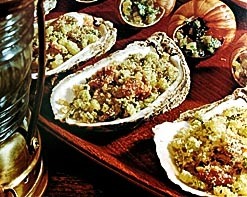 Dip oysters in melted butter, then in dried bread crumbs, and arrange on broiler. Broil about 3 minutes. Have ready 6 slices of toast, cut in uniform pieces. Moisten toast with hot oyster juice. 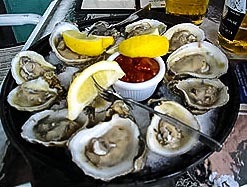 Place 4 broiled oysters on each slice of toast and season with salt and pepper, and a few drops of lemon juice. Serves 6. Bring to the boiling point, stirring to keep smooth. Add the chopped oysters. Bake 15 minutes at 400°. Serves 6 as a first course, 3 or 4 as a luncheon or supper dish. Place 2 oysters in deep half of one shell. Repeat to fill 12 shells. Arrange shells on plastic try or paper plate. Sprinkle with paprika. Serve hot. Micro tip: Custard cups may be substituted for oyster shells. Put all ingredients except oysters into a blender. Cover. Press button 13 for 20 seconds. Remove cover and add oysters and liquid in can. Cover. Press button 3 for 10 seconds, or until oysters or coarsely chopped. Pour mixture into saucepan and heat, stirring until thick and smooth. Add the oyster liquid gradually, stirring constantly. Bake at 400 until thoroughly heated. Serves 6 to 8. Combine all ingredients, warm to taste. Clams can be substituted for oysters. Serve with saltines or oyster crackers. Bake 30 minutes at 450, turning the sausages once to brown. Serves 4. For a pleasantly subtle flavor, sprinkle each layer with a few gratings of nutmeg. -Put a thin layer in a shallow butted baking dish. Cover with half the oysters. Sprinkle with salt and pepper. Add 2 tablespoons oyster liquid or clam juice. Add 1 tablespoon milk or cream, repeat. Cover the top with the rest of the crumbs. Bake 30 minutes at 450°. Serves 4.